I did my search and found plenty of help. I would like to thank everyone who contributes information. It sure helps. I thought I'd contribute a couple pictures. My truck ia a 1999 F150 with manual heat/ac (115,000? miles). From the amount of rust, I've apparently been missing a couple speeds for a long time. The melted plug could have been more recent and took out #3. 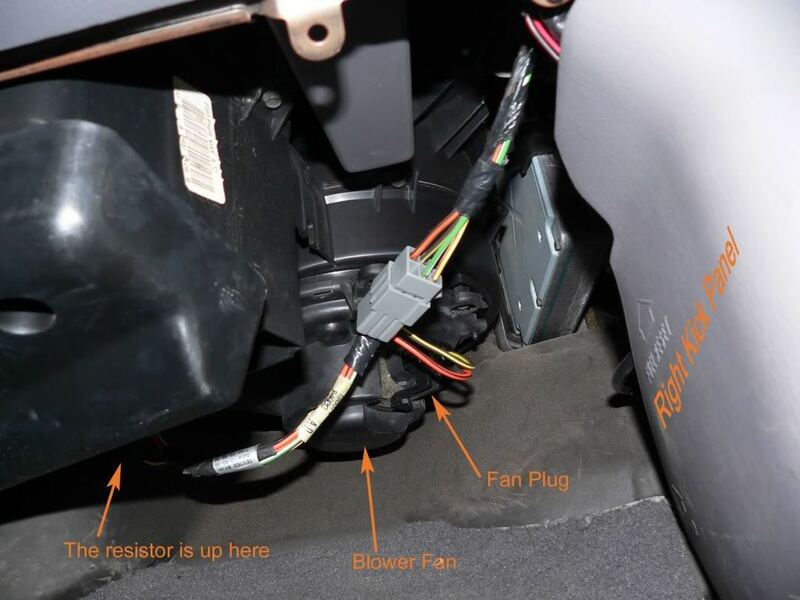 The resistor is located on the passenger side, under the dash, near the firewall. It's difficult to see. If you look near the kick panel, you can see the wire harness and the plugs. Follow the wire to the resistor. Last edited by SSCULLY; 06-02-2009 at 08:16 AM. I picked up the new resistor today at the local Ford dealer. They didn't have the wire harness in stock, but it was going to cost over $38. I "repaired" the old plug and put it back together. Fan works great. Wow! I can't believe it rusted/melted like that. Nice article! I just did this on my dads 01 f-250, it was slightly different, but the same concept. Good write up! Just found this article was having the same issues. Mine also melted at the connector. I am logging this with NHTSA. This seems to be an obvious fire hazzard. I just replaced the Resistor Pack (Board) on my 2002. Much the same scenario, but my connector was perfect. And an interesting thing was the amount of corrosion in comparison to the resistor packs on my 1986 and 1985 T-Birds (pulled near the same day). The T-Bird packs were corrosion free. Ths most likely has something to do with the Pack being on the bottom of the case in our trucks. I have the same problem with my 1997 F150. I didn't notice the harness trouble until after I had purchased the new resistor. I purchased the resistor based simply on the symptoms, before inspecting it. I would like more information on repairing the harness, which I would like to do without investing another $38. Are the plastic adapter ends pretty standard? If so, do I find them at an auto parts store or somewhere else? And are the wires soldered into it? Thanks. Had the same resistor problem with my 95 Mustang. Looked the same, totally corroded. It went out around 70,000 miles. Good post. This thread was the reason I came to F150online! My fan switch only worked on possitions 3 and 4 (if they were numbered that's what they would be). I joined the site, did a search and in seconds I found exactly what I needed to fix my switch. I bought the part yesterday and did the swap in the parking lot of Ford (5 minutes tops) and just like that my heat works like new again. Thanks for the awesome write up and pictures! Thanks! You made it too easy! Happy New Year! I drive a '96 E150 with front and rear air. The other day the front blower suddenly quit, while the rear air (same control panel) blows cold. Replaced the 60amp blower fuse under the hood, still nothing. Slammed the door getting back in, and the fan came back on, but after shutting it off, no amount of door slamming helps. Since the fan works on none of the speeds, should I first look at the switch on the dash, or the resistor? 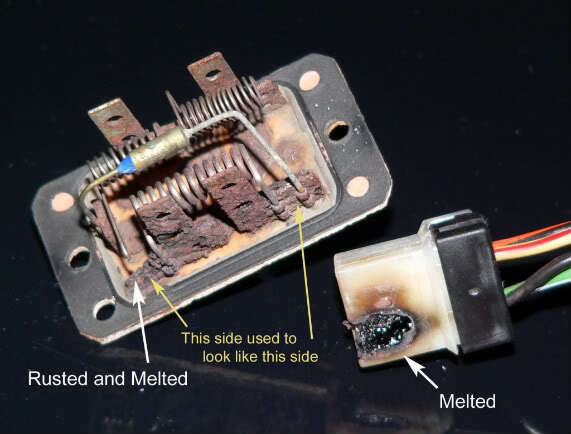 This happens because of oxidation of the connector causing high resistance, generating more heat, whhich creates more oxidation, etc. The trick is to exclude contact with air and moisture. I had this same thing happen to me on my '99 F150. I found the burned/melted connector, and was able to find a good replacement in a local junk yard. When I put it in the truck, I made sure all the connectors on the resistor and on the plug were clean, and I coated the connections with a heavy coat of hi-temp silicone dilectric compound (regular "bulb socket grease" should work, too). It's been like that for over a year now, and I checked it recently. No sign of any heating or burning - hopefully, it'll stay that way!